Antipsychotics in Alzheimer’s disease A critical analysis Eduardo Marques da Silva, Rafaela de Castro Oliveira Pereira Braga, Thiago Junqueira Avelino-Silva, Luiz Antonio Gil Junior Abstract – The estimated worldwide prevalence of dementia among adults older than 60 years of age was 3.9% in 2005. About 90% of demented patients will develop neuropsychiatric symptoms (NS) such as delirium, delusion, aggressiveness and agitation. The treatment of NS involves non-pharmacologic strategies (with varying degrees of success according to the scientific literature) and pharmacologic treatment (PT). The present review of literature examined the current role of AP in the management of NS in dementia. Methods: A thematic review of medical literature was carried out. Results: 313 articles were found, 39 of which were selected for critical analysis. Until 2005, the best evidence for PT had supported the use of selective serotonin re-uptake inhibitors (SSRIs), anticholinesterases, memantine and antipsychotics (AP). In 2005, the U.S. Food and Drug Administration (FDA) disapproved the use of atypical APs to treat neuropsychiatric symptoms in individuals with dementia (the same occurred with the typical APs in 2008). After this, at least two important randomized placebo-controlled multicenter trials were published examining the effectiveness of atypical APs in Alzheimer’s disease (CATIE-AD) and the effects of interrupting AP treatment (DART-AD). Conclusions: Based on the current evidence available, APs still have a place in treatment of the more serious psychotic symptoms, after the failure of non-pharmacological treatment and of an initial approach with selective inhibitors of serotonin uptake, anticholinesterases and memantine. Key words: antipsychotics, dementia, side effects, Alzheimer, neuropsychiatric symptoms. Antipsychoticos na doença de Alzheimer: uma análise crítica Resumo – A prevalência mundial de demencia entre idosos foi de 3,9% em 2005. Cerca de 90% dos dementados apresentarão sintomas como delirium, alucinações, agressividade e agitação. O tratamento dos sintomas não cognitivos envolve estratégias não farmacológicas – com sucesso variável de acordo com a literatura – e tratamento medicamentoso. A presente revisão de literatura discute o atual papel dos antipsicóticos nos sintomas neurocomportamentais de demência. Métodos: Conduzimos uma revisão temática nas principais bases de dados da literatura. Resultados: 313 artigos sobre o tema foram encontrados e 39 selecionaos para compor uma análise crítica. Até 2005, as melhores evidências para tratamento medicamentoso indicavam o uso de inibidores da acetilcolinesterase memantina e antipsicóticos. Em 2005 o FDA desautorizou o uso de antipsicóticos atípicos em dementados (em 2008 fez o mesmo com os típicos). Após isto, 2 ensaios clínicos randomizados placebocontrolados foram concluídos avaliando a eficácia dos antipsicóticos atípicos em portadores de doença de Alzheimer (CATIE-AD) e os efeitos da interrupção destes (DART-AD). Conclusões: Considerando as evidências atuais, os antipsicóticos ainda têm importância no manejo dos sintomas psicóticos mais sérios, após falha de tratamento não farmacológico e de uma abordagem inicial com inibidores de receptação de serotonina, anticolinesterásicos e memantina. Palavras-chave: antipsicoticos, demencia, efeitos colaterais, Alzheimer, sintomas neuropsiquiátricos. Department of Geriatrics, Clinical Hospital of The University of São Paulo, São Paulo SP, Brazil. Eduardo Marques da Silva – Departamento de Geriatria / Hospital das Clínicas da Faculdade de Medicina da Universidade de São Paulo / Av. Dr. Enéas de Carvalho Aguiar 255 - 05403-000 São Paulo SP - Brazil. E-mail: [email protected] Disclosure: The authors reports no conflicts of interest. Received December 8, 2010. Accepted in final form February 10, 2011. 38 Antipsychotics in Alzheimer’s disease Silva EM, et al. The estimated worldwide prevalence of dementia among adults older than 60 years old was 3.9% in 2005.1 According to 2008 data, the prevalence in São Paulo (Brazil) was 12.9%, and Alzheimer’s disease (AD) was responsible for 59.8% of all dementias.2 AD is a lethal progressive neurodegenerative disorder, and is characterized by cognitive decline, loss of capacity to execute daily activities, and a variety of behavioral symptoms.3 About 90% of demented patients will develop neuropsychiatric symptoms (NPS) such as delirium, delusion, aggressiveness and agitation (78.33% of Brazilian elders).45 These NPS eventually precipitate institutionalization,6 functional decline,7 and contribute to caregiver stress and depression.8,9 The treatment of AD neuropsychiatric symptoms has been the target of multiple lines of research in recent years. Non-pharmacologic strategies have been shown to work with variable success10,11 and include the use of music,12-14 aromatherapy,15 pet therapy and family members videos.16-18 Pharmacologic interventions include agents such as benzodiazepines, anticholinesterases, memantine, antidepressants, mood stabilizers, anticonvulsants and antipsychotics (AP). In addition, it is known that the prescription of drugs for NPS in dementia is influenced by a variety of factors, including caregiver stress.19 The objective of this article was to discuss the latest evidence examining the management of neuropsychiatric symptoms in dementia with an emphasis on neuroleptics. Methods In preparing for this review, a search of the literature from 1999 to September 2009 of several electronic bases (Medline, PubMed, ScieLO, LILACS, and the Cochrane Library) was carried out. Keywords used individually and in various combinations included: antipsychotics, dementia, Alzheimer’s disease and neuropsychiatric symptoms. The filters used were double-blind, placebo-controlled, randomized trials (RCT), meta-analysis, case series and review articles. The references generated were checked and analysed for the qualitative relevance on the basis of their title and abstract, while other references drawn from the papers identified were followed up. Results The search method retrieved 313 articles. Of these, 79 were RCTs, 59 non-randomized trials, 9 meta-analyses, 60 reviews and 106 case series. A total of 39 articles were selected based on their qualitative relevance. 40 Antipsychotics in Alzheimer’s disease Silva EM, et al. sub-item for withdrawn depression factor. Comparing the other scales, no statistical difference was detected among the groups. Analysis of the characteristics of the studied groups showed that the group randomized for olanzapine presented with a lower NPI during the initial phases of the study. In the group analyzed at the 12th week, 63% of the participants had discontinued the medication (due to intolerability or lack of efficacy). cation dose or placebo, as well as individuals that did not get to begin the allocated treatment (excluding the subjects that had interrupted their treatment before 12 months). This analysis also included patients with a modified intention to treat (including all patients that used at least one medication dose or placebo). The results from this study showed a mortality rate increase in the group that continued with AP, particularly after the first year. The accumulated survival percentages for the AP and placebo groups were as follows: to the 24th month, 46% versus 71%; to the 36th month, 30% versus 59%; and to the 42nd month, 26% versus 53%, respectively. The analysis for intention to treat or modified intention to treat presumed that the patients stayed in the originally allocated group for at least 12 months. Death Certificates for 78% of these patients were reviewed, and did not reveal an increased incidence of cerebrovascular disease in the group that continued receiving AP. However, once the study was accomplished, a telephone follow-up was conducted to assess mortality rates only after the first 12 months of treatment. Therefore, a limitation of this analysis was the lack of information regarding the subsequent antipsychotics’ prescription at the end of the 12-month period of the protocol for the placebo group (or the incidence of retreatment in the group that received AP for 12 months). Another limitation was the exclusion of individuals with an MMSE score of less than 6, whom had a greater risk of death. The authors suggest caution in interpreting these data, especially considering that few participants were analyzed at the later time points in the study. Considering the current evidence available, APs still have a place in the treatment of the more serious psychotic symptoms associated with dementia, such as anger, aggression, and paranoid ideas, although they do not appear to improve functioning, care needs, or quality of life. After the failure of non-pharmacological treatment as an initial approach to solve these symptoms, and of selective inhibitors of serotonin uptake, anticonvulsants, anticholinesterases and memantine, the lack of safer alternatives enforces the use of antipsychotics for dementia neuropsychiatric symptoms. In addition, there is reasonable evidence favoring the use of atypical agents over typical ones, even though no one specific agent has been defined as the drug of choice based on the available literature. There is an urgent need for novel alternative therapeutics. References 1. Ferri CP, Prince M, Brayne C, et al. Global prevalence of dementia: a Delphi consensus study. Lancet 2005;366:2112-2117. 2. Bottino CM, Azevedo D Jr, Tatsch M, et al. Estimate of dementia prevalence in a community sample from Sao Paulo, Brazil. Dement Geriatr Cogn Disord 2008;26:291-299. 3. McKhann G, Drachman D, Folstein M, Katzman R, Price D, Stadlan EM. Clinical diagnosis of Alzheimer’s disease: report of the NINCDS-ADRDA Work Group under the auspices of Department of Health and Human Services Task Force on Alzheimer’s Disease. Neurology 1984;34:939-944. 4. Ballard C, Gray A, Ayre G. Psychotic symptoms, aggression and restlessness in dementia. Rev Neurol (Paris) 1999;155 (Suppl 4):S44-S52. 5. Tatsch MF, Bottino CM, Azevedo D, et al. Neuropsychiatric symptoms in Alzheimer disease and cognitively impaired, nondemented elderly from a community-based sample in Brazil: prevalence and relationship with dementia severity. Am J Geriatr Psychiatry, 2006;14:438-445. 6. Steele C, Rovner B, Chase GA, Folstein M. Psychiatric symptoms and nursing home placement of patients with Alzheimer’s disease. Am J Psychiatry 1990;147:1049-1051. 7. Lopez OL, Wisniewski SR, Becker JT, Boller F, DeKosky ST. Psychiatric medication and abnormal behavior as predictors of progression in probable Alzheimer disease. Arch Neurol 1999;56:1266-1272. 8. Clyburn LD, Stones MJ, Hadjistavropoulos T, Tuokko H. Predicting caregiver burden and depression in Alzheimer’s disease. J Gerontol B Psychol Sci Soc Sci 2000;55:S2-S13. 9. Coen RF, Swanwick GR, O’Boyle CA, Coakley D. Behaviour disturbance and other predictors of carer burden in Alzheimer’s disease. Int J Geriatr Psychiatry 1997;12:331-336. 10. Ayalon L, Gum AM, Feliciano L, Areán PA. Effectiveness of nonpharmacological interventions for the management of neuropsychiatric symptoms in patients with dementia: a systematic review. Arch Intern Med 2006;166:2182-2188. 11. Opie J, Rosewarne R, O’Connor DW. The efficacy of psychosocial approaches to behaviour disorders in dementia: a systematic literature review. Aust N Z J Psychiatry 1999;33: 789-799. 12. Clark ME, Lipe AW, Bilbrey M. Use of music to decrease aggressive behaviors in people with dementia. J Gerontol Nurs 1998;24:10-17. 13. Gerdner LA. Effects of individualized versus classical “relaxation” music on the frequency of agitation in elderly persons with Alzheimer’s disease and related disorders. Int Psychogeriatr 2000;12:49-65. 14. Witzke J, Rhone RA, Backhaus D, Shaver NA. How sweet the sound: research evidence for the use of music in Alzheimer’s dementia. J Gerontol Nurs 2008;34:45-52. 15. Ballard CG, O’Brien JT, Reichelt K, Perry EK. Aromatherapy as a safe and effective treatment for the management of agitation in severe dementia: the results of a double-blind, placebo-controlled trial with Melissa. J Clin Psychiatry 2002;63: 553-558. 16. Doody RS, Stevens JC, Beck C, et al. Practice parameter: management of dementia (an evidence-based review). Report of the Quality Standards Subcommittee of the American Academy of Neurology. Neurology 2001;56:1154-1166. 42 Antipsychotics in Alzheimer’s disease Silva EM, et al. 17. Cohen-Mansfield J. Nonpharmacologic interventions for inappropriate behaviors in dementia: a review, summary, and critique. Am J Geriatr Psychiatry 2001;9:361-381. 18. Cohen-Mansfield J, Werner P. Management of verbally disruptive behaviors in nursing home residents. J Gerontol A Biol Sci Med Sci 1997; 52:M369-377. 19. Szulik J. Antipsychotics in geriatric institutions. Vertex 2007; 18:454-460. 20. Sink KM, Holden KF, Yaffe K. Pharmacological treatment of neuropsychiatric symptoms of dementia: a review of the evidence. JAMA 2005;293:596-608. 21. Pollock BG, Mulsant BH, Rosen J, et al. A double-blind comparison of citalopram and risperidone for the treatment of behavioral and psychotic symptoms associated with dementia. Am J Geriatr Psychiatry 2007;15:942-952. 22. Pollock BG, Mulsant BH, Rosen J. Comparison of citalopram, perphenazine, and placebo for the acute treatment of psychosis and behavioral disturbances in hospitalized, demented patients. Am J Psychiatry 2002;159:460-465. 23. Cummings JL, Mackell J, Kaufer D. Behavioral effects of current Alzheimer’s disease treatments: a descriptive review. Alzheimers Dement 2008;4:49-60. 24. Howard RJ, Juszczak E, Ballard CG, et al. 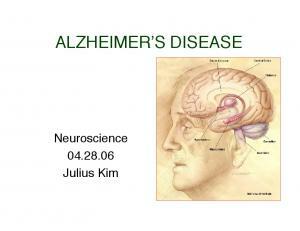 Donepezil for the treatment of agitation in Alzheimer’s disease. N Engl J Med 2007;357:1382-1392. 25. Pinheiro D. Anticonvulsant mood stabilizers in the treatment of behavioral and psychological symptoms of dementia (BPSD). Encephale 2008;34:409-415. 26. Kim Y, Wilkins KM, Tampi RR. Use of gabapentin in the treatment of behavioural and psychological symptoms of dementia: a review of the evidence. Drugs Aging 2008;25:187-196. 27. Lanctôt KL, Herrmann N, Mazzotta P, Khan LR, Ingber N. GABAergic function in Alzheimer’s disease: evidence for dysfunction and potential as a therapeutic target for the treatment of behavioural and psychological symptoms of dementia. Can J Psychiatry 2004;49:439-453. 28. Alkhalil C, Hahar N, Alkhalil B, Zavros G, Lowenthal DT. Can gabapentin be a safe alternative to hormonal therapy in the treatment of inappropriate sexual behavior in demented patients? Int Urol Nephrol 2003;35:299-302. 29. Ballard C, Corbett A, Chitramohan R, Aarsland D. Management of agitation and aggression associated with Alzheimer’s disease: controversies and possible solutions. Curr Opin Psychiatry 2009;22:532-540. 30. Schneider LS, Pollock VE, Lyness SA. A metaanalysis of controlled trials of neuroleptic treatment in dementia. J Am Geriatr Soc 1990;38:553-563. 31. Lonergan E, Luxenberg J, Colford J. Haloperidol for agitation in dementia. Cochrane Database Syst Rev 2002:CD002852. 32. Ballard C, Howard R. Neuroleptic drugs in dementia: benefits and harm. Nat Rev Neurosci 2006;7:492-500.
at: 44th Annual New Clinical Drug Evaluation Unit; June 1-4, 2004; Phoenix, Ariz. 46. Liperoti R, Gambassi G, Lapane KL, et al. Cerebrovascular events among elderly nursing home patients treated with conventional or atypical antipsychotics. J Clin Psychiatry 2005; 66:1090-1096. 47. Herrmann N, Mamdani M, Lanctot KL. Atypical antipsychotics and risk of cerebrovascular accidents. Am J Psychiatry 2004;161:1113-1115. 48. Herrmann N, Lanctot KL. Do atypical antipsychotics cause stroke? CNS Drugs 2005;19: 91-103. 49. Schneider LS, Dagerman KS, Insel P. Risk of death with atypical antipsychotic drug treatment for dementia: meta-analysis of randomized placebo-controlled trials. JAMA 2005;294: 1934-1943. 50. FDA. The Food and Drug Administration Public Health Advisory: deaths with antipsychotics in elderly patients with behavioral disturbances. 2005 10/05/2009; Available from:http:// www.fda.gov/cder/drug/advisory/antipsychotics.htm. 51. FDA. The Food and Drug Administration - Information for Healthcare Professionals - Antipsychotics. 2008 10/05/2009; Available from: http://www.fda.gov/cder/drug/InfoSheets/ HCP/antipsychotics_conventional.htm. 52. Gill SS, Bronskill SE, Normand SL, et al. Antipsychotic drug use and mortality in older adults with dementia. Ann Intern Med 2007;146:775-786. 53. Schneeweiss S, Setoguchi S, Brookhart A, Dormuth C, Wang PS. Risk of death associated with the use of conventional versus atypical antipsychotic drugs among elderly patients. CMAJ 2007;176:627-632. 54. Setoguchi S, Wang PS, Alan Brookhart M, Canning CF, Kaci L, Schneeweiss S. Potential causes of higher mortality in elderly users of conventional and atypical antipsychotic medications. J Am Geriatr Soc 2008;56:1644-1650. 55. Samuel C. Durso, L.G., Bernard Roos, and Martin Gorbien. Guidelines abstracted from the American Academy of Neurology’s dementia guidelines for early detection, diagnosis and management of dementia. 2003 cited 2009 04/05/2009; Available from: http://www.americangeriatrics.org/products/ positionpapers/aan_dementia.shtml. 56. Zheng L, Mack WJ, Dagerman KS, et al. Metabolic changes associated with second-generation antipsychotic use in Alzheimer’s disease patients: The CATIE-AD Study. Am J Psychiatry 2009;166:583-590 57. Sultzer DL, Davis SM, Tariot PN, et al. Clinical symptom responses to atypical antipsychotic medications in Alzheimer’s disease: phase 1 outcomes from the CATIE-AD effectiveness trial. Am J Psychiatry 2008;165:844-854. 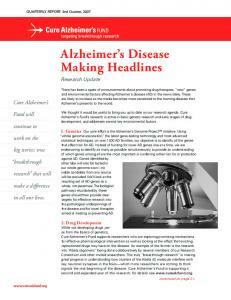 Report "Antipsychotics in Alzheimer s disease"